People often want to price their property just above market value for the purpose of leaving some negotiating room in the equation. However, when a property is prices above its market value, there will likely be less traffic through the property. Leading to less opportunity for an offer to be made. Usually the longer the property sits, the lower the price will have to go and so on. It’s a vicious cycle. We call this chasing down the market. So when you do go to sell your home you want to price your property just at or maybe even a little below market value to sell it for the greatest amount of money, in the least amount of time, with the least amount of hassle. This chart shows what can happen if you overprice your home by even 10%. 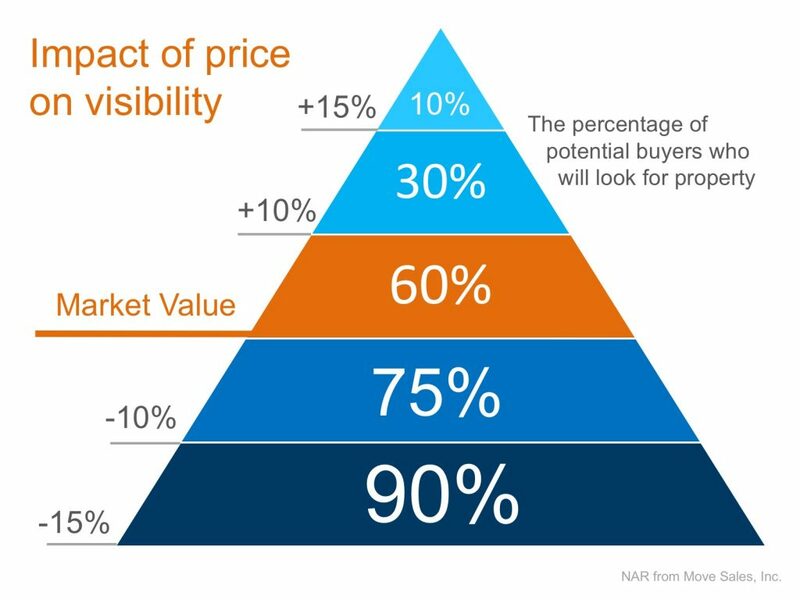 To get the greatest number of potential buyers into your home for sale, be sure to price it right at Market Value. Your Realtor has the technology and skill to get your home priced right. Let us help you price your property right to get it sold quickly and for the greatest dollar value! A home is a big investment and just like having other investments reviewed annually, it is a good idea to have the value of your home reviewed as well. Whether you are thinking of selling or just want to know the value of your home, give us a call for a complimentary comparative market analysis with current market conditions.